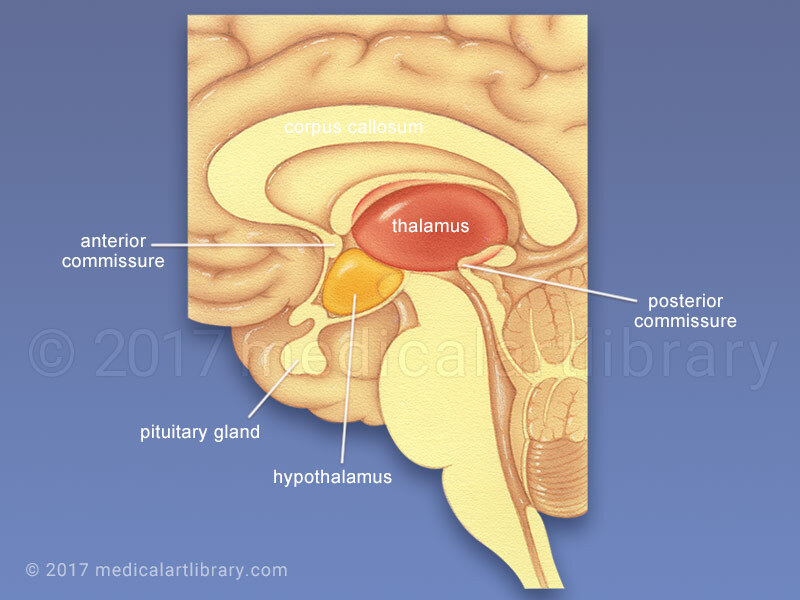 The thalamus is an olive shaped structure about one inch in length. It serves as a relay station for impulses traveling to and from the spinal cord, brain stem, cerebellum and cerebrum. It has an important function in directing sensory input to the appropriate place in the cerebral cortex. Sensory input from the body, the eyes, ears and other senses (except for smell) pass through the thalamus. The hypothalamus is located below the thalamus. The hypothalamus is an important center for many critical internal body functions. The hypothalamus monitors water concentration, hormone concentrations and body temperature. It is associated with feelings of rage, aggression, hunger and thirst. The hypothalamus also plays an important role as an intermediary between the nervous system and the endocrine system (hormones). The hypothalamus has many connections with the pituitary gland and can produce and regulate hormones.